Dior Addict Lip Glow is a lovely, lovely thing. It’s a lip balm that adjusts to the moisture levels in your lips to produce a glow that’s unique to the wearer. The packaging is just beautiful and it’s a pleasure to use. Alas, being Dior it also comes with a Dior price tag. Since my current Lip Glow is on its way out and the evil dentist has stolen all my cash to torture me, I’ve been looking for a cheaper dupe. Keeps my mind off the root canals. So I’ve found this Korean Lip Glow dupe at a quarter of the price of the original – what do you think? 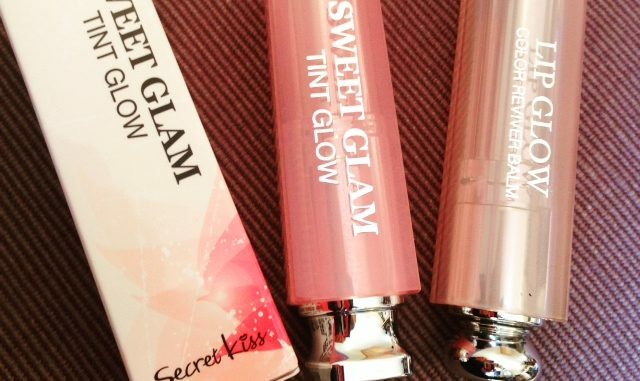 This is Sweet Glam Tint Glow by Secret Key, one of my favourite underrated Korean brands (they do lovely toners BTW). The packaging certainly looks authentic, with its opaque pink case around a silver inner core. The Secret Key has squarer edges to the Christian Dior’s rounded corners, but if you whipped it out of your handbag quickly I think you’d fool a lot of people. Both products feel pretty much identical in your hand – according to my kitchen scales, the Dior original weighs 28g and the Korean dupe is 24g, so it’s very much not a flimsy copy. 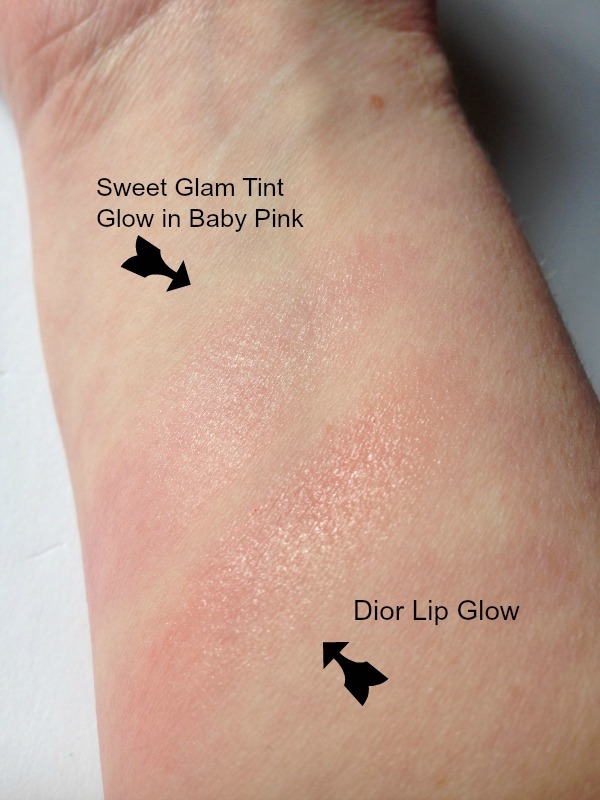 Sweet Glam Tint Glow comes in 7 mostly pinkish shades and it doesn’t claim to adjust to suit your own colouring in the way that the Dior version does. In that respect, they are very different. But if you are looking for an elegantly packaged lip balm with a hint of pink sheen, then there’s not a lot to choose between them. Where the Dior product does much better is to moisturise – it stops lips feeling dried out for several hours, whereas the Secret Key product feels drier sooner and needs to be reapplied more frequently. If you’re splurging, then Dior Lip Glow is a lovely product to use and own. 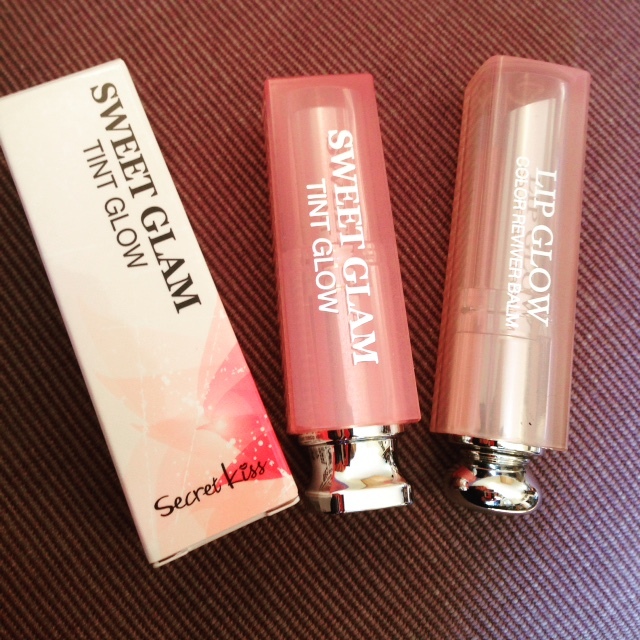 But if you’re saving, then I think Secret Key Lip Glow is a pretty good substitute. Lip Glow Colour Reviver Balm by Dior is widely available online and in high street stories, RRP £24. I think I bought mine from Boots.